Summary: Finding Winnie tells the story of a young veterinarian who happens to purchase a bear before heading off to war. He raises the bear, named Winnie, along with his fellow soldiers and they all grow immensely attached to Winnie. When they are called to battle, the vet brings Winnie to a zoo for safety where she eventually meets Christopher Robin Milne and his father and author A. A. Milne. The rest of the story becomes history. The author is the great granddaughter of the veterinarian and the book is written as a story she is telling her own son. This book gives you all the feels you could possibly want, especially if you have ever been a fan of Winnie the Pooh. Most of us (myself included) never knew how Winnie the Pooh came to be. I knew that the characters created by Milne came from real life inspirations, but had no idea that there was a real bear or that she had such an amazing journey! Overall, the story is sweet and inspiring; the illustrations are gorgeous with great attention to detail. The only thing I would suggest is a warning to children that you should not try to keep a pet bear! I, too, read this book and found it enjoyable. I know that the story of Winnie-the-Pooh came from the child's stuffed animal, however, I never knew there was a real bear behind the stuffed animal. 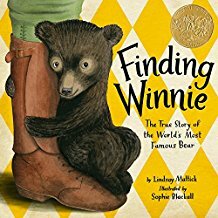 I think those who enjoy reading Winnie-the-Pooh would enjoy reading the background story about Winnie.